From backyards to Main St…. Pizza Barbone began making their Neapolitan wood fired pizzas by trekking their mobile oven around Cape Cod and the Boston area since the Spring of 2010. After finding much success at local farmer’s markets, public events and customer’s private parties all over MA, they set down roots at a brick and mortar location at 390 Main St. in Hyannis, MA. There they bake their pizza in a beautifully handcrafted Stefano Ferrara oven, which was built from scratch by third generation oven-makers out of rock and ash from Mt. Vesuvius and covered in hand painted glass tiles before being shipped from Naples, Italy. The oven was the first of its kind in Massachusetts so it is a truly exciting experience to bring the delicious pizza that this 900-degree oven turns out to the people and visitors of Cape Cod. We are dedicated to using only fresh seasonal ingredients and making as much of our product from scratch that we possibly can. We take care in the food we create starting with the non-GMO "00" flour we import from Italy all the way down to making every spoon of gelato, splash of dressing and ladle of sauce in-house. All in compliment to the vegetables we grow on our rooftop garden! House made and house grown, from our rooftop-farm to your table! Pizza Barbone built and planted their very own rooftop garden in the spring of 2013 kicking off the urban rooftop farming movement on Cape Cod. With 8 raised beds and 30 self-watering containers all made by the chef’s own hands, Pizza Barbone began their journey towards growing produce with a view of the city streets below. 18,000 pounds of organic Rooflite soil was lifted by crane to their rooftop vegetable oasis where they grow a plethora of organic vegetable. To name a few, the Pizza Barbone garden includes varieties of tomatoes, potatoes, runner beans, beets, carrots, onions, peppers, parsley, cauliflower, marigolds, cucumbers, squash and fresh herbs. All of their rooftop crops make their way on to their customers plates with the confidence that because they grow it and harvest it themselves they know they are serving their customers the freshest and most seasonal produce on their pizzas and in the dishes they craft. Chef/owner Jason O’Toole has been achieving career success since the young age of 17 when he set off to be a part of the team at Le Cirque in New York City. Shortly after his time with Le Cirque he continued on to complete his studies at the Culinary Institute of America in Hyde Park, NY. Jason took the talent he acquired from his practice at the CIA to London to work for Chef Gordon Ramsay at his Claridge’s restaurant. He then returned to MA to work in various chef positions around Boston and Cape Cod. Prior to starting Pizza Barbone, Jason had been working as a personal chef for several years on board a privately owned yacht and at the owner’s various residences. While traveling down the east coast in October of 2009, the boat made a stop in Charleston, S.C. where Jason found himself at a restaurant by the name of Extra Virgin Oven (EVO). During his visit to the wood fired pizza restaurant, he met the chefs and owners of EVO and learned about their story of starting off traveling around to local farmers markets with their mobile oven and working with the fresh local ingredients from the Charleston farming community. The very next day Jason returned to the restaurant to purchase the mobile oven they had for sale and the story of Pizza Barbone began. By May of 2010 Jason was operating his mobile oven at public events and farmers markets on Cape Cod. He quickly established a large following of customers booking private parties and has successfully continued with that to today.In the winter of 2012 Jason excitedly signed a lease on his first brick and mortar location for Pizza Barbone on Main St. in Hyannis. Through the Spring he worked tirelessly with the crew building out his new space and proudly opened the doors for his first customers on Father’s Day weekend. Jason enjoys talking with as many of his guests in the restaurant as he can and looks forward to all of the years of Neapolitan pizzas he will be bringing to the visitors, residents and customers of Pizza Barbone. I started out my life daydreaming of two things. First and foremost, finding the love of my life and secondly, food. As fate would have it, they happened to come in the form of a package deal. As a kid, I grew up with a love of entertaining my sisters with impressions of famous figures from the food world of the 80’s. Whether it be Julia Child or the Swedish Chef from the Muppets, I always found a way to command my sisters attention on long car rides in the family station wagon with “cooking show” improvs much to their delight. Upon my many travels with my family I also kept travel journals, which in turn, really ended up being food journals. My entries most often focused on what I ate that day, where I was when I ate it and what was so wonderful about it. For me, there was always an opportunity to make the enjoyment of a meal or a sweet treat last even longer by jotting it down to pour back over and savor all over again. There was a particular piece of cake on a plane ride to Florida once that my family reminisces on my documentation of quite hilariously! Flash forward several years later to December 22, 2009. This was the day my life changed in a way I can’t even explain with words. I found the love of my life, Jason O’Toole, and he far surpassed anything I had ever dreamt of for myself. Together we share our love of food and travel, but more importantly than anything, our love for each other. We began our relationship starting our own business together and ever since have looked forward to every single day as best friends loving, laughing, eating, traveling and growing a business together! Please inform us if you or any member of your party has a food allergy. Marinara | Margherita | Soppressata | Bianca Verde. Many of our items can be made vegan and/or gluten free for our guests. We offer a housemade vegan cashew mozzarella for an additional $2.00. Gluten free dough is an additional $4.00 per crust. We also offer a vegan coconut milk gelato on our dessert menu. Our gluten free crust is intended for those who are looking to reduce gluten in their diet. Our GF crust is prepared in a common kitchen and baked in a common oven. Therefore, a risk of gluten exposure is present. We take every effort to maintain gluten free work spaces, but there may be trace amounts of gluten present. Pizza Barbone does not recommend this pizza for customers with Celiac disease as there is no guarantee that the product is 100% gluten free. Customers with gluten sensitivities should exercise personal judgment in consuming our gluten free crust. Our pizzas are 12” in diameter and are generally sufficient as a serving for one person. The liquid from the sauce and cheese create a hot molten area at the center of the pizza. For this reason, Neapolitan pizza is best enjoyed with a knife and fork. 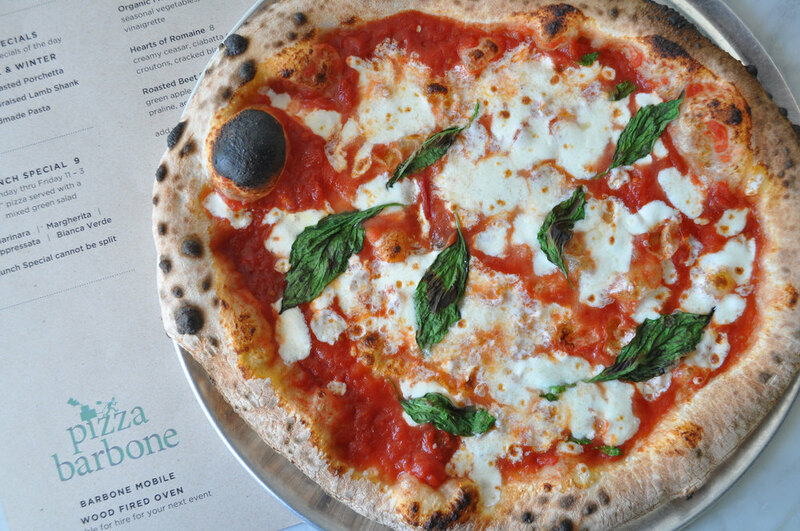 Neapolitan pizza has a varying degree of charring to it. This char on the sides and bottom of the crust adds a subtle layer of flavor and texture to the pizza. There is a careful balance of crust, sauce, and cheese. With Neapolitan pizza there is never too much of any one component. We love keeping you updated with our favorite photos and what's new at Pizza Barbone.